“If you are considering a trip to Egypt don’t hesitate to go with Explore Travel and Cruises. I have often been a single, lone traveller, but I am quite certain that I could not have visited all the places that I saw in the ten days on my own as I did on this recent trip. The arrangements for collecting the guests by taxi, boat and horse drawn carriage etc was fantastic. My hotel swimming pool in Giza overlooked the Pyramids and our guide took us to all the main sites including the astonishing Cairo museum. He pointed out the most important artefacts and his knowledge appeared to be very sound and reading about Egyptology before and after my trip has added to this understanding and continued curiosity about Egypt. There are many talks and lectures at the British Museum which will now have a new depth following my visit. Following the great turmoil in Egypt after the revolution, there seem to be far fewer tourists than usual. The trip down the Nile on the Dahabiya Dream was just that, a dream. Waited on hand foot and finger by Hamada and steered by the friendly crew this is a truly memorable journey. Stopping at El Kab, one of the first cities in Egypt, deserted and spectacular, makes Explore Travel and Cruises something special. The wonders of Luxor, Karnak, the Valley of the Kings, The Aswan Dam and Abu Simbel to name but some of the treasures, were all made so easy and accessible to us by our guide who had our comfort and excitement to see such wonders at heart. 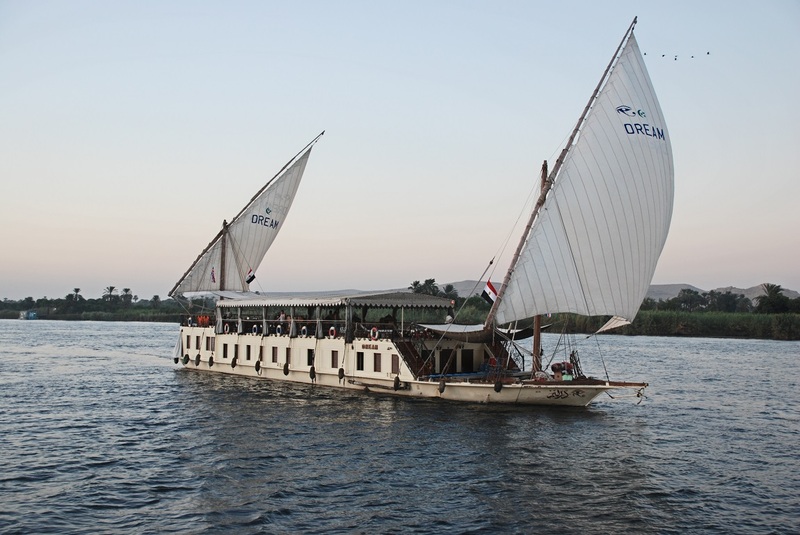 We passed very little traffic on the Nile and all five guests breathed a sigh of relief and joy that we were on such a delightful sailing boat and not a huge metal ship! 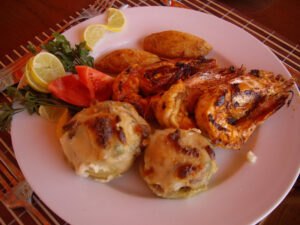 There were special treats organised by the boat manager and guide all of which were highly appreciated. Our guide was also a budding ornithologist and pointed out the spectacular birdlife along our way. I’m always delighted if I see one heron on the river Wye in the summer; we saw hundreds of them as well as Hoopoe, Pied kingfishers, Egrets and Sandpipers to name but a few other birds. I got up at five am to do my yoga and meditate as the sun rose over the Nile. A dawn chorus like you’ve never heard one before. This experience will remain in my archive forever. There is a good selection of books on board and I couldn’t put down, “A thousand miles up the Nile” by the intrepid Victorian Egyptologist Amelia Roberts. Reading “Nefertiti” and “The Heretic Queen Nefertari” by Michelle Moran also brought life to these age old stories which our guide sought to narrate to us on our travels. We enjoyed excellent, good, simple home cooking, a triumph given the tiny galley that the cook had to work in! The boat is small enough to be intimate and large enough to give space to both the smokers and, like me, the non- smokers! The decor is delightful and those who saw it in the Woman and Home magazine it hardly does it justice. Please feel free to share this post and don’t forget to sign up to our newsletter to keep up to date with Explore Travel and Cruises. A huge thank you from Justin and I. We had such a wonderful time on The Dream, the Dream team are superb!! We are trying to figure out when we can go again! Have been sharing our experience and passing on your details to people who have become very interested. I hope some of them will contact you. Again thank you for the most memorable and special trip. I've decided not to have any more birthdays as they just won't hold a candle to this last one! Sign up for our regular e-newsletter that will keep you up to date with offers, destination news and lots more. Copyright © 2019 Explore Travel and Cruises.